Come to The Wine Bar Fridays and Saturdays from 7-10pm for live music. 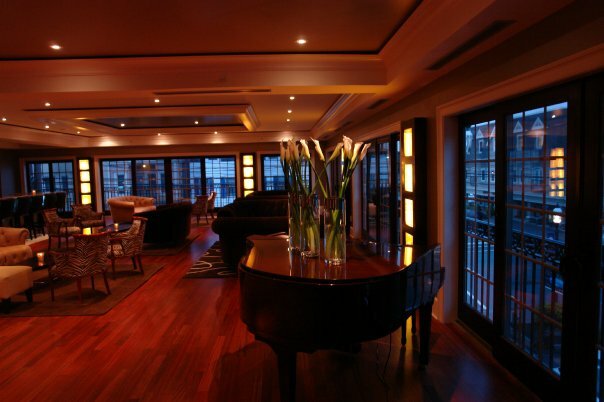 Our baby piano separates the lounge from the dining room for our pianists and singers to entertain the whole loft. Get cozy in our overstuffed sofas and sip one of our 24 glasses of wine by the glass in our modern, elegant atmoshphere. Happy Hour Every Thursday and Friday! The Wine Bar is a smart, contemporary and spacious loft in Atlantic Highlands. Diners seeking a new wine and dine adventure will find exactly what they are looking for just a short stroll from the Atlantic Highlands Marina. The completely renovated and decorated 4,000-square-foot restaurant and lounge surrounded by airy French doors, which open to catch the refreshing sea breezes. It offers a variety of special dining areas creating a different way to experience the Wine Bar whether dining with a loved one, with a group or solo. The lounge is filled with overstuffed sofas and animal print armchairs, while the dining area sets a romantic mood. Separating the lounge from the dining room is a baby grand piano, where in the future singers and pianists may perform. The wine list features over 120 labels and 24 wines. The Wine Bar is all about taste adventure, and the menu reflects this with wine-friendly selections that will satisfy the palette. We do not have a set close time.